With the first quarter of 2019 now in the books, we have a clearer picture of how the housing market is likely to move this year. So I’m taking this generous head start in 2019 to forecast 2019, because, frankly, I’m more likely to get it right. Jobs are the principal driver of the demand for housing and regional home sales. With near unlimited job opportunities right now together with rising incomes, home sales have nevertheless been unimpressive, and in much of California they declined last year. The demand for rental housing instead has dominated housing choice, as both Millennials and Boomers look to non-ownership housing. That’s why of course so much more apartment product is being built nowadays. Moving boomer households may actually prefer to rent to avoid all those annoying repairs and those big property tax bills in December and April. And Millennials simply don’t have the down payment. Existing home sales are forecast to remain at muted levels in 2019 and 2020. 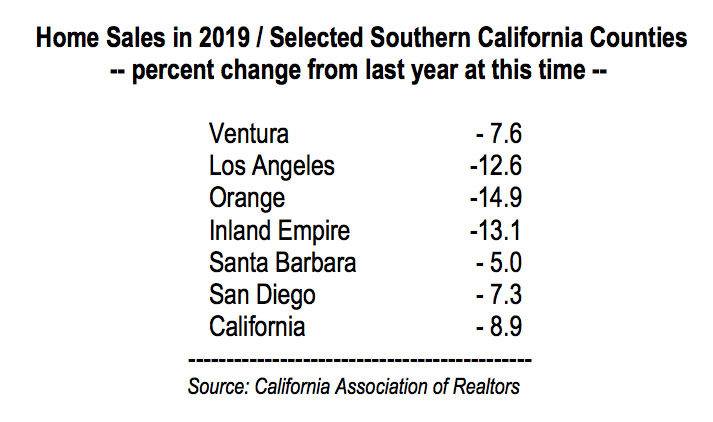 The fall-out that occurred in 2018 with sales falling 5 percent in California is unlikely to be reversed this year. This late in the expansion, home buyers are reluctant to buy homes at record high prices with the expectation that a recession is coming. There is still the memory of the 2006-2007 housing bubble and the aversion to buying at the top. While a lack of inventory has been a constraining factor on home sales in recent years, this year inventory is rising, just about everywhere you look. Consequently, with more supply and a reticence to buy, look for softening prices in 2019. A meaningful correction in prices is not forecast because the economy will remain strong, incomes will continue to rise, and many households will still elect to buy, especially as interest rates surprisingly move lower. 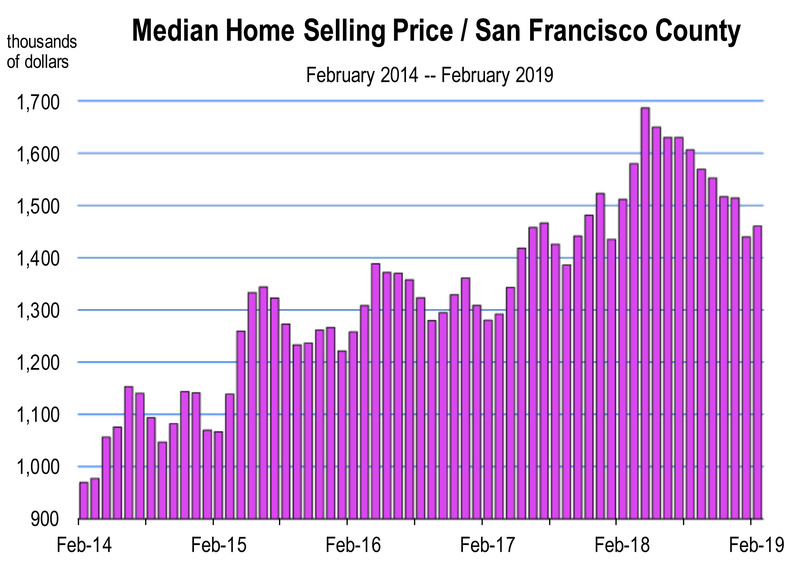 Year to date, the statewide median selling price is about 2 percent higher than year ago values, though there are price corrections occurring in Ventura, Orange, Los Angeles, San Francisco, Monterey, Santa Clara, and Sonoma Counties. Our base forecast for home price appreciation does moderate however, and the alternative forecast turns negative if sales fall off further. However, a major correction in prices is unlikely to occur in 2019.